Harold Cazneaux, ‘A study in curves’, 1931. Gelatin silver print. ANMM Collection 00054649. More than fifty of Cazneaux’s beautiful photographs, at once a joy to behold and a historical narrative, were featured in Through a different lens – Cazneaux by the water (2016). Harold Cazneaux (1878–1953) is a giant in the history of Australian photography. In the late 1890s, he became interested in the idea of photography as art, rather than simply a mechanical recording process, after being exposed to European photographers working in a style known as Pictorialism. He was to become one of its most passionate advocate in Australia; exploring poetry, mood, atmosphere and form through his impressionistic ‘seeing’ eye. For more than 50 years Cazneaux’s camera art captured the romance, life and light of the world as it changed around him. After Cazneaux moved from Adelaide to the harbour city of Sydney in 1904, its waterways and the coastline soon became as exciting and fertile to the aspiring artist photographer as the cityscapes of his new home. This exhibition took you back in time to explore Cazneaux’s soft-focus world but also at times pulls you out of it, back to today, to reflect on his interests in lost harbourscapes, around one hundred years after he photographed them. This area is devoted to ‘then and now’ and juxtaposes some of Harold Cazneaux’s key waterfront compositions with scenes taken by our museum photographer, Andrew Frolows. 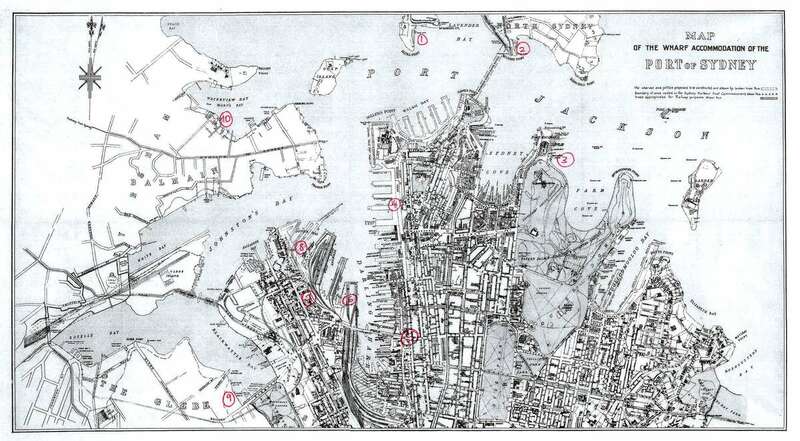 Map of Sydney Harbour with locations of Cazneaux’s photographs marked, in red. Image: ANMM. It was a time before the steel armature of Sydney’s Harbour Bridge framed the waterways, when punts or ferries carried carts, wagons, horses, omnibuses, cars and people across the water to the north shore, when the industry, smoke and energy of two new power stations at Pyrmont and Ultimo fuelled the growing city’s homes, businesses and trams, and when rail lines snaked along the foreshore connecting the crowds of ships and their cargoes wharfside to broader markets within the country and overseas. If you wanted to take your horse, cart or motor car across the harbour before the Sydney Harbour Bridge opened in 1932, you took a vehicular ferry, known as the horse ferry or punt. There were two main harbour crossings in the late 19th century: between Fort Macquarie and Milson’s Point, and between Dawes Point and Blues Point. Both closed when the bridge opened. Blues Point at McMahons Point is now parkland and retains the stone work from the two ‘horse ferry’ wharves – incoming and outgoing. Remnants of the stone wharf at Dawes Point exist under the southern pylon of the Sydney Harbour Bridge. Under the bridge’s northern pylon the Milson’s Point terminal is now parkland, while the Fort Macquarie wharf is the site of the Sydney Opera House. Milson’s Point was the major gateway on the northern shore, connecting carts, cargoes and passengers with trams and trains at the wharf terminal, operated by North Shore Steam Ferry Company from the 1870s and by 1899 Sydney Ferries Limited. Vehicular or horse ferries serviced the western side of the wharf and passenger ferries the east. The ferries were named for Aboriginal people or places, including Barangaroo, Benelon (Bennelong), Killara, Warrane and Kedumba shown here. Many of these are place names today. The three stacks from the Pyrmont Power Station can be seen through the smoke. It opened in 1904 to power Sydney City Council’s new electric lights. While the people of Pyrmont wanted electric trams and lights, with these developments came pollution, coal dust and smoke-filled air. The power station had an original capacity of 500kW, which was increased to 200mW by 1955 to meet community demand. Ultimo Power Station was built on the southern edge of Pyrmont in 1899 to power the trams. Pyrmont was heavily industrialised and expansion was expensive. Another power station at Bunnerong, in south- eastern Sydney, was built to boost production, but Pyrmont continued until the mid-1980s. The power station was demolished in the 1990s to make way for the Star City Casino. Jones Bay was named after Private Thomas Jones of the New South Wales Corps, who had only a brief connection with the area. In 1795 he was granted 55 acres (22 hectares) on the western shore of Cockle Bay, Darling Harbour, but sold it soon afterwards. Jones and his wife were hanged in Sydney in 1799 for the murder of a missionary. The Sydney Harbour Trust built the Jones Bay Wharf berths 19–21 from 1911 to 1919, extending into Jones Bay on Pyrmont’s western shore near sandstone quarries that built many of Sydney’s public buildings. Wharves 19, 20, 21 and 22 were redeveloped with new approaches from the workers’ housing on the high cliffs at Pyrmont Point and new railway sidings linking the wharves to the Darling Harbour rail network. In 1999 a scheme to redevelop Jones Bay wharf was finalised. The wharf buildings are now offices and restaurants.